It has been almost 11 months since we moved to our new office on the Miracle Mile in Los Angeles and with our new location; we have been able to organize many more events that are open to the public. 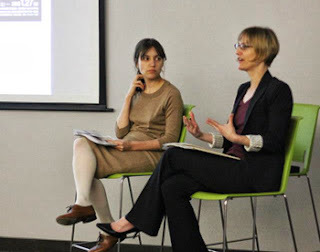 One of our most popular programs is our lecture series where we invite specialists in a field related to any aspect of Japan including, but not limited to, pop culture, gaming, politics, technology, research, traditional culture and food. Below is a list of all the lectures we have presented so far. 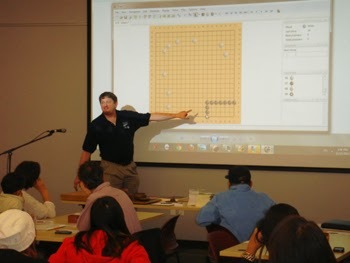 For our very first lecture, we invited Andrew Okun, President of American Go Association, to talk about the ancient board game of Go with some hands on gaming afterwards. Participants had an educational afternoon learning about the history and development of the game as well as basic instructions to play the game. This lecture was organized in collaboration with the American Go Association. For the second lecture, we invited Dr. Takanori Shibata, the creator of PARO, the world’s most therapeutic robot to talk about his invention and allow the guests to experience the comforting effects of the robotic baby harp seal. Dr. Shibata also discussed the advancements of robotics in Japan and the ways that the cutting edge technology is used to help in everyday lives. 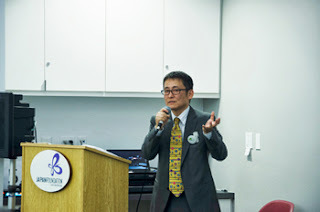 During the month of January, we had another lecture with Satoru Mimura from the Fukushima Future Center for Regional Revitalization at Fukushima University. He talked about his work to support the people affected by the Great East Japan Earthquake by researching the effects of radiation caused by the Fukushima Dai-ichi power plant. Based on his findings, he hopes to develop a plan to offer prospects in support of the restoration and rehabilitation of Fukushima. This event was co-organized by the Japan America Society of Southern California. 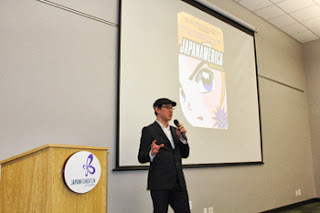 The popularity of anime has had a long history in the United States and to introduce it to a young audience, we invited Roland Kelts, author of “Japanamerica: How Japanese Pop Culture Has Invaded the U.S.,” to discuss his views on Anime, its influences on Hollywood, and vice-versa. Keltz used many examples from his research to show the symbiotic relationship between American and Japanese culture. He was also on hand to sign copies of his book after the lecture. 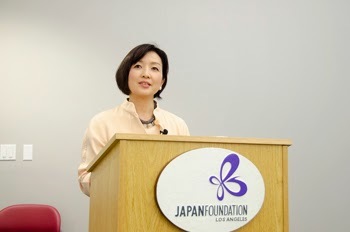 In March, we invited Aiko Doden, Senior News Commentator for Japan Broadcasting Corporation, to talk about many issues that have an effect on US Japan Relationship in 2013. This event was co-organized with the Los Angeles World Affairs Council and Young Professionals and as a result we had many youth leaders in attendance who were interested in the world affairs and making a positive contribution to society. For our sixth lecture, we invited Debra Samuels, Boston Globe food writer, cooking instructor and author of the popular cookbook “My Japanese Table: A Lifetime of Cooking with Friends and Family” to talk about her inspiration and love for the Japanese bento (lunch box). 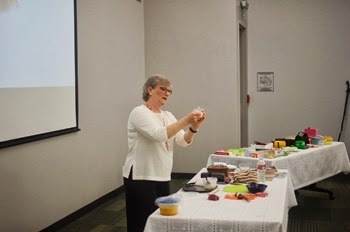 The lecture was divided into three parts where Samuels described her time in Japan and how she was introduced to the art of Japanese cuisines, demonstrated how she prepares her food, and invited participants to assemble their own bentos using pre-made items. Everyone who attended received a gift bag with a maccha cupcake featuring Samuels’ recipe and a box of green tea courtesy of Takaokaya. We invited Masako Nishikawa and Kirk Nishikawa Dixon from the Nishikawa School of Classical Japanese Odori (Dance) to talk about what they do and demonstrate Traditional Japanese Theatre Make-Up. 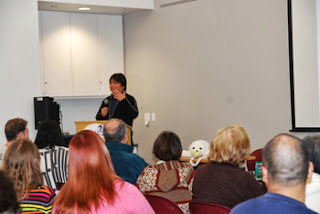 After the initial presentation covering the history of Nishikawa Ryu, Kirk fielded questions from the crowd while Masako demonstrated the intricacies of Japanese theatre costumes from the white makeup to the elaborate hairpiece and kimono. At the end of the lecture, everyone wanted to take pictures with Masako, who was fully dressed for Classical Japanese Odori. Through the Japan Foundation’s Curator Exchange Program, Britt Salvesen, Curator and Head of the Photography Department at the Los Angeles County Museum of Art (LACMA) and Amanda Maddox, Assistant Curator of Photographs at the Getty Museum, had the opportunity to visit Japan and tour many contemporary art museums in Japan with a focus on photography. During this lecture, they shared their experiences from the trip as well as their new interest in Japanese photography and art. The popularity of our lecture series has steadily grown during the past few months and we are currently in the process of organizing more lectures for the upcoming months. We will continue to present exciting and lively events here at JFLA that will appeal to all age groups and interests.